Located south of Alifu Alifu, Alifu Dhaalu Atoll is also regared South Ari. Collectively both atolls are regarded as Ari Atoll. This is one of the most densely developed atolls in terms of resorts. Here is the map of Alifu Dhaalu Atoll. 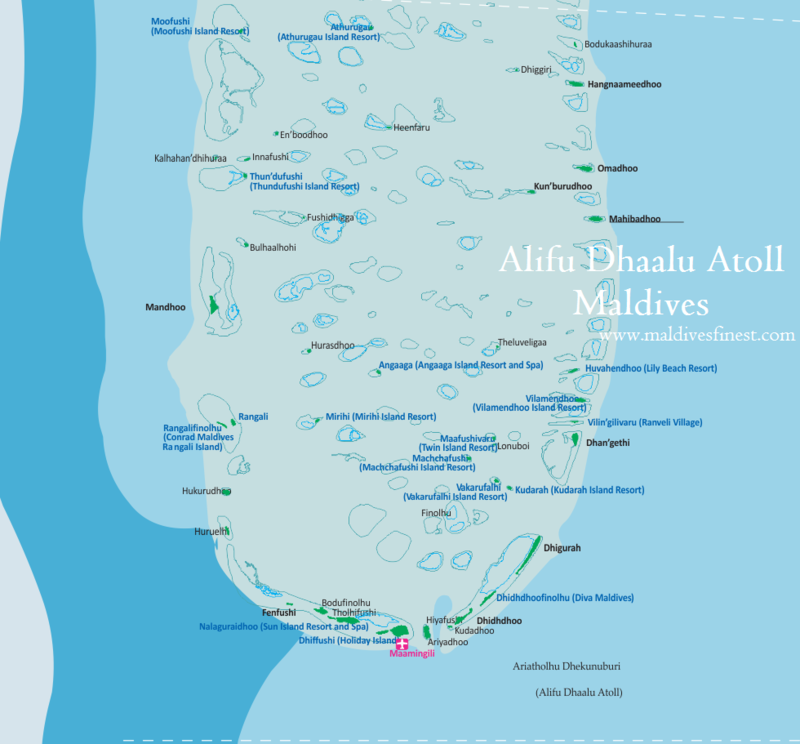 This is the map of Alifu Dhaalu Atoll, just one of the 26 natural atolls in Maldives. If you want to see map of entire Maldives or the world map we have covered this topic on a separate post. The only domestic airport in this atoll is in Maamigili island. Most of the resorts in this atoll take advantage of this airport as it is cheaper than seaplane which flies only day time. Therefore, the domestic flight is very ideal for tourists who visit Maldives at night. Otherwise, to take seaplane you will have to wait for next day. Staying overnight near Male’ or Ibrahim Nasir International Airport is most convenient at Hulhule’ island which is just 5 minutes drive and the hotel is located on the same island as airport. A lot cheaper but smaller hotels are in Hulhumale island, about 10 minutes drive. Hulhumale’ is another island but connect to airport by a roadway. Usually the hotel arrange they own shuttle bus to pick you up and also to drop you back. A unique feature of Alif Dhaalu Atoll is its whale shark point. This is one of the few spots where you see whale sharks all year round. Hanifaru Bay in Baa Atoll is also popular for whale sharks and manta ways but it is seasonal. In Alifu Dhaalu Atoll, whale sharks are seen near Dhigurah, in some seasons they are seen near Maagili. It seems they move around between these spots based on season. Wherever you see whale sharks you also see manta rays. Because these two species feed on tiny planktons. At least this is the case in Maldives. Alifu Dhaalu Atoll also takes the advantage of its close distance from Ibrahim Nasir International Airport. The most frequent mode of transfer is seaplane. Regular speedboat ferries are operated from Male’ to local islands. There are guesthouses that usually offer $120 – $150 per night per room packages, transfer costs $25 – $35 person per way. There is a good demand for these guesthouse holidays.